September 26 at 9h30, at Sala Raínha Sonja (CUBO) of the Faculty of Architecture, University of Lisbon. 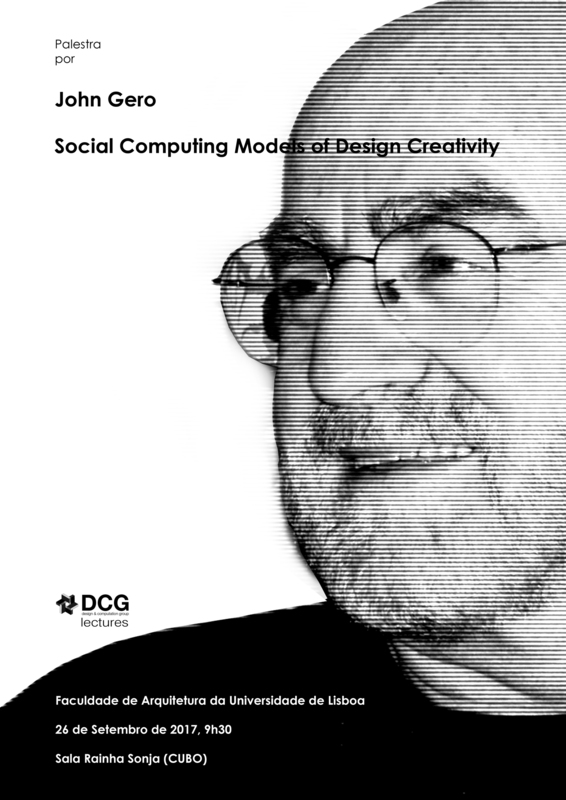 Two implemented social computing models of creativity are presented. The first implementation demonstrates the behavior of a social, situated, curious agent-based model that generates products within an ecology of other producers that results in emergent social structures that influence the creativity of producers. The second implementation demonstrates how the value systems consumers use to evaluate products as innovative change as they interact with product representations and interact socially with other consumers. • results from a study of innovation through consumer social behavior. John S Gero is Research Professor at UNCC and at the Krasnow Institute for Advanced Study. He has edited/authored over 50 books and published over 650 research papers. He has been a professor of computer science, cognitive science, architecture, civil engineering, and mechanical engineering at MIT, UC-Berkeley, UCLA, Columbia and CMU in the USA, at Strathclyde and Loughborough in the UK, at INSA-Lyon and Provence in France and at EPFL in Switzerland. His recent research has been funded by NSF, NASA and DARPA.